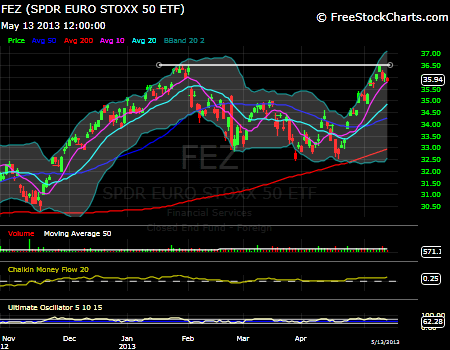 Today’s mixed trading session ended SPDR EURO STOXX 50 (FEZ) price movement within my expectations. As I wrote in my previous post “How to invest with small money” I would invest in this ETF to take advantage of investing small money into a commission free ETF. Investing into FEZ is basically an experiment to me. Generally I wasn’t much successful investing into ETFs in the past, so I want to give it another shot. I think I know the reasons for my previous failure – fees and small investments. Today, after trading I adjusted my trigger price. This adjustment is within my “entry into stocks” strategy which I myself call a contingency order strategy. The strategy is about waiting for the stock to reverse into a correction and then track the price down and basically place your buy order slightly higher than the previous day high price. With this strategy you can ride the stock all the way down and you get the order exercised only when the stock reverses. If you provide the stock with some “wiggling” space as Dave Landry speaks about in his book “The Layman’s Guide to Trading Stocks” you will get executed only when the stock really reverses and resumes the trend. This strategy will almost allow you to fish for the bottom. On rare occasions you can get executed prematurely. It has happened to me in a very few occasions since I’ve been started practicing this entry into stocks method. Mostly I was profiting on this squeezing more juice from the stocks then if buying outright. On Friday last week I entered my contingency order (or trigger order) wanting to buy FEZ only if the stock reverses and reaches $39.29 a share. It didn’t happen today and the stock continued down. The new closing price was at $35.94 a share. My strategy then dictates me to lower my trade trigger down to new $36.04 a share. I expect FEZ going lower because of the price action I can see at the chart below. From the chart I can see the stock reached the previous high and bounced off of it. The simplest way to read this chart from technical analysis perspective is that now the stock would go down to its 50 day MA from which it should bounce back up. Of course this is a book-like theory. Everything can happen. Today’s market is crazy, sometimes defying the principles of technical and fundamental analysis (I think, it is because FED is messing up with the market, but that’s another story). If I am correct, I should be able to pick up my 2 shares at around $34.5 a share.